Every year, when upset season begins, an article emerges from a well-meaning but staggeringly uptight writer who has taken time out of his or her precious days on Earth to lecture college kids about storming the court. There have to be rules, you see. We can’t just storm for the love of the game. It’s not dignified! You know the drill. The rigid enthusiasm cop chides the overzealous fans and sets up arbitrary guidelines, of which there are two mainstays. First, the victory has to be an upset against a top-ranked team or a bitter rival. Second, it should end on a buzzer-beater or something equally dramatic. I believe I speak for the curmudgeons when I say: Indiana, you may storm the court. Personally, I think courts should be stormed all the time. If the vibe is good, why not? My guiding philosophy is to storm first and ask questions later. In fact, I’ve often been reprimanded for storming the court when it was inappropriate. A few times, I’ve been mistaken for a hardworking ball boy because I was the only one storming. And on one memorable afternoon, I stormed a traffic court. The moment felt right. The point is, life is too short to save your court storms for a better time. Lucky for Hoosiers fans, there was no dilemma Saturday. The 73-72 win over no. 1 Kentucky provided the perfect opportunity to occupy the hardwood, and occupy they did, with stolid Midwestern joy. And relief, too, because it was nearly a classic missed opportunity — and very few losses are harder to take than a blown upset. After trailing most of the game, Kentucky clawed back to take its first lead in 16 minutes on Darius Miller’s dunk with two minutes remaining. But the Hoosiers stayed resilient, and after Kentucky missed two of its final three foul shots, Christian Watford nailed the game-winning 3 from the left wing. Not much there, right? 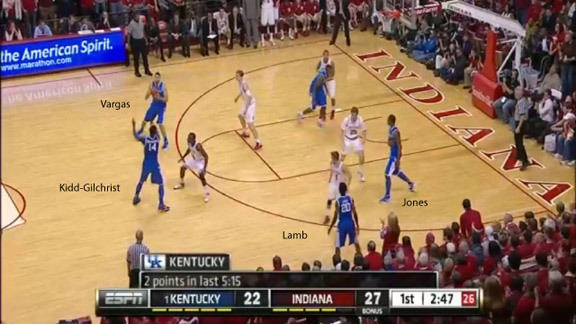 We can see that Kentucky actually shot a bit better than the Hoosiers. The Wildcats also turned it over less, but had a slight deficit on the offensive boards, where Indiana freshman Cody Zeller gave his team five of its 14 second chances. But let’s go back to turnovers; yes, Indiana turned it over at an extremely high 26.1 percent rate. 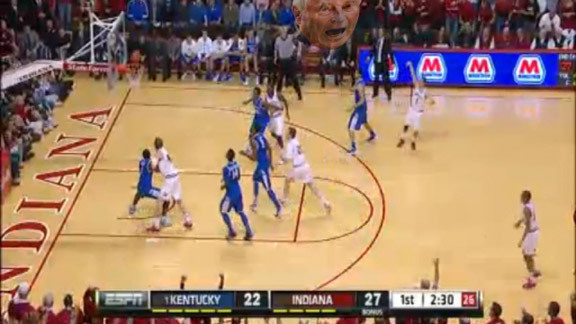 But the Hoosiers managed to make Kentucky turn it over almost as often. In fact, the Wildcats’ 24.6 percent rate was well up from their 18.1 percent season average. Forcing this kind of error-prone game was actually quite a coup for the Hoosiers, even though the numbers indicate a draw. Crean probably believed that if it came to a dogfight, his guys could hit more 3s. The game bore him out; the Hoosiers ended with nine to just two for Kentucky. More on this in a second. The game was played fairly evenly, as the numbers would indicate, except for two crucial stretches. The first came late in the first half, with 6:44 remaining. Indiana trailed 20-18, and 70 percent of the points it had allowed to Kentucky had come on dunks or layups. But in the next four minutes, Indiana went on a 12-2 run to take a 30-22 lead. That margin vanished almost immediately, but the second half would bring an even more dramatic run. Trailing 35-34 with 18 minutes remaining, the Hoosiers exploded for 11 unanswered points in just two minutes, taking a double-digit lead at 45-35. Unlike the first one, this lead would last a long time; almost the whole game, in fact. And though Kentucky was the better team for most of the other 34 minutes, the two Indiana spurts gave the Hoosiers a chance to steal a famous win at the end. Again, the turnovers are the thing to watch. Kentucky finished with 17, and it says a lot that almost 50 percent of them came in this six-minute sliver, which accounted for just 15 percent of game time. So how did Indiana do it? Well, we know both teams like to play fast (they’re in the top 30 percent in adjusted tempo in the country), and neither Crean nor Kentucky coach John Calipari were going to slow things down for a tactical advantage. But armed with his first truly talented group at Indiana, Crean could reasonably hope that his team’s shooting would benefit from Kentucky turnovers. Indiana is currently the second-best 3-point shooting team in the country, with an excellent 45.8 percent rate. Kentucky, meanwhile, barely even attempts 3s; the Wildcats are 325th in Division I in 3-point attempt percentage, a reflection of the fact that they prefer to run, dribble penetrate, and feed talented post players like Anthony Davis and Terrence Jones. In other words, it was critical that Calipari’s team avoided a turnover-heavy game. It’s easier for any offense to find open 3s off turnovers than it is from the half court set. This is particularly true against a strong defensive unit like Kentucky, which, after the loss, is still the fifth best in the country. And that takes us back to the original point; Crean would gladly concede turnovers in exchange for a more-or-less-equal amount from Kentucky. A war of attrition always benefits the smarter team. His guys would do better with the opportunities if they could make 3s at their usual high rate. As it turned out, they did even better, shooting 9-of-15. To get a more specific idea of how Indiana forced the turnovers, let’s take a look at a play from the first of the two Hoosier runs. With 2:49 left in the first half and Kentucky trailing 27-22, Anthony Davis was on the bench with two fouls and Doron Lamb was playing with two of his own. Zeller had just exploited Kentucky’s depth problem with a beautiful spin move in the lane against the outclassed Eloy Vargas, bringing Assembly Hall to a fever pitch. 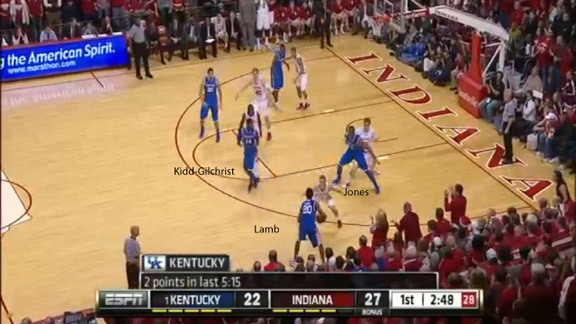 Lamb dribbled upcourt, trying to find Jones in the post and stop the Hoosier momentum. 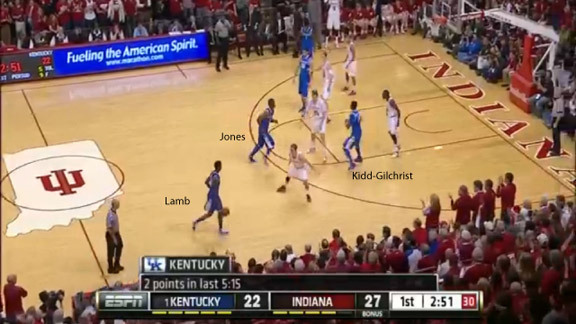 You can see Jones moving down from the top of the key, and Michael Kidd-Gilchrist waiting to set a pick. 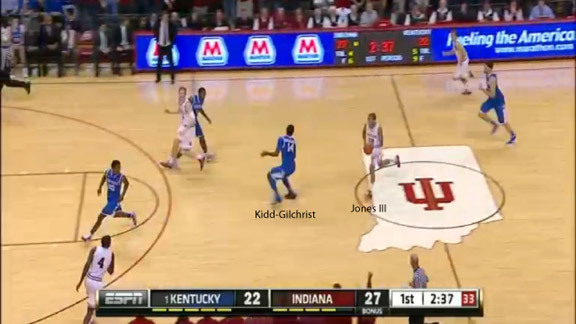 Incidentally, Kidd-Gilchrist has the coolest name in college basketball this season. Every time the announcers say it, it sounds like they’re talking about a western gunslinger. And you can tell they like it, too. Tom Pritchard, the 6-foot-9 forward responsible for Jones, is making life hell for Kentucky as he fights through the screen. The Hoosiers didn’t show much full-court press, but the cornerstone of their defense was a very aggressive half court man-to-man that took the Wildcats a long time to figure out and unsettled them from the outset. 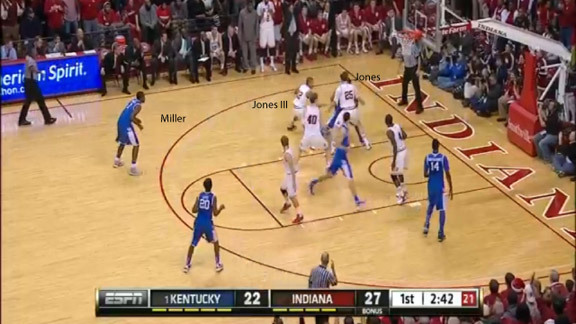 Jones was open in the post, but Calipari designed this play to go to the opposite side. Lamb, at this point, might have been well-advised to ignore the play and just feed Jones when he was open. 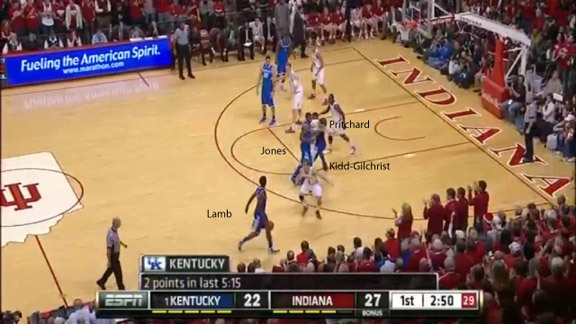 Instead, he executes the play as designed and passes to Kidd-Gilchrist at the top of the key. 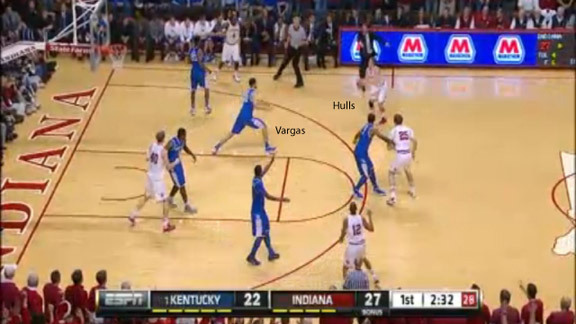 Vargas dribbles left. At the same time, Darius Miller sneaks over to set a baseline back screen for Jones. 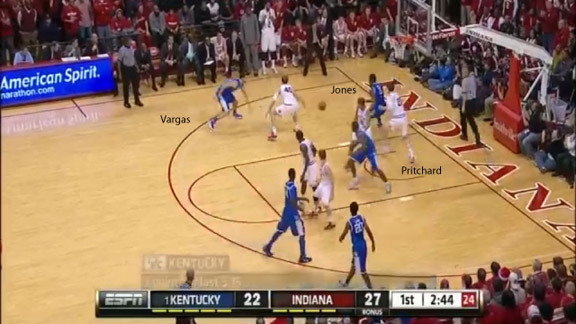 Vargas makes the entry pass, and Pritchard does a nice job fighting through the second screen he’s seen. Still, Jones is in a dangerous position close to the rim. After the screen, Miller pops out past the 3-point line on the left wing. This is designed to bring Verdell Jones III, his man, away from the post and give Terrence Jones a one-on-one situation against Pritchard. But as you see from the picture, Verdell Jones is well coached, and he’s not biting. He’s simply not worried about Miller hitting a 3, and for good reason; this season, Miller is 6-of-26 from 3-point range, for an awful 23 percent. 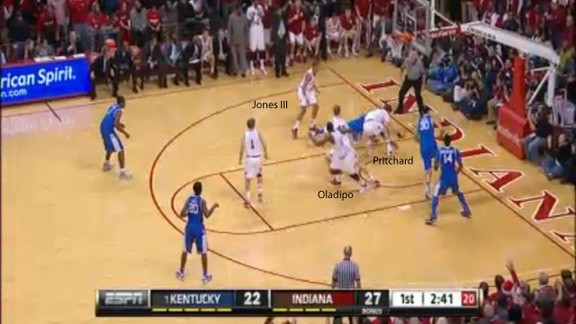 Instead of wasting his time, Verdell Jones double-teams Terrence Jones, giving Pritchard some much-needed help. This was a common theme throughout the game, and it was possible because Indiana wasn’t the least bit scared of Kentucky’s 3-point shooting ability. In fact, look at the setup in this picture. The Hoosiers nearly have all five players in the lane. Athleticism was their enemy, not shooting. It works. Verdell Jones strips the ball from Terrence Jones as he tries to make a move, and Pritchard gathers it under the basket. Indiana’s Victor Oladipo reacts most quickly; he’s already headed downcourt. A quick pass back to Verdell Jones, and the break is on. Kentucky fails to stop the ball. It isn’t until half court that Kidd-Gilchrist begins to turn around to pick him up. Otherwise, the Wildcat defense is fairly sound. But letting Verdell Jones go that far unimpeded is mistake enough. Verdell Jones drives all the way to the rim before turning around. At this point, four Kentucky defenders are in the lane. This lack of discipline in transition defense is the mark of a young team, and the Wildcats will pay for it. Look at Vargas specifically. In the last picture, he was step-for-step with Jordan Hulls. Here, he’s run all the way into the lane. Hulls has not. For the record, Hulls is shooting 52 percent from 3 this season. Hulls is by himself. Vargas races out, but it’s far too late. Bingo. Somewhere, Bobby Knight is lovin’ it the only way he knows how. 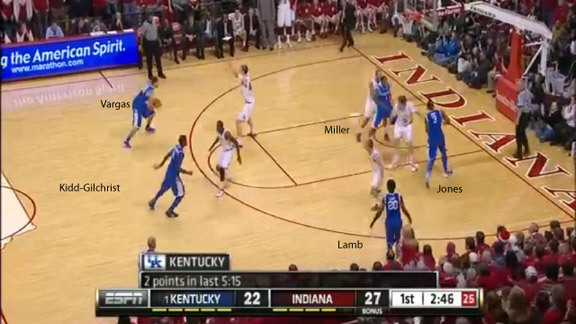 This telling sequence showcased Indiana’s strengths triumphing over Kentucky’s inexperience. It didn’t happen often; as I said, Kentucky was the more athletic team, and it arguably controlled play for 75 percent of the game. But the Hoosiers, plucky lads, made use of their sporadic genius to stay close enough for a heroic finish. When the time came, as we all remember, Watford was Johnny-on-the-spot. And you have to love Crean’s expression after it went down; that’s the tormented face of a man whose heart is on double time. Storm away, you crazy reds.